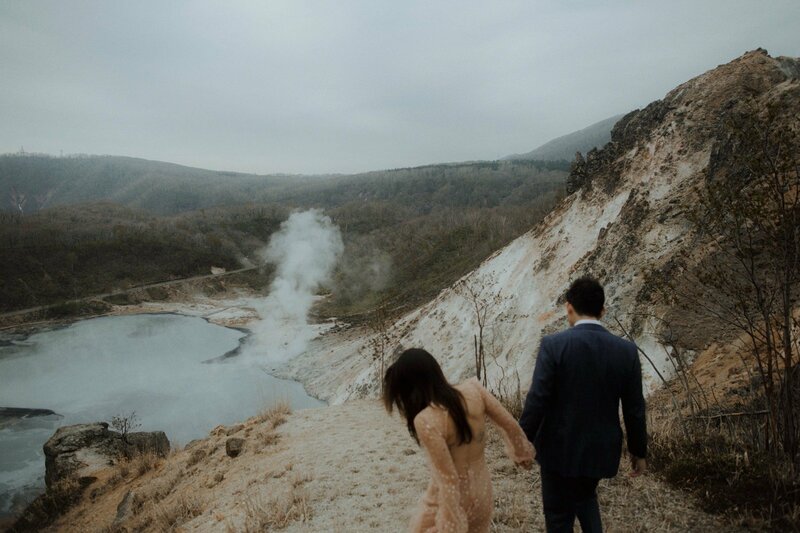 After several visits to Japan, I never thought I’d finally get to photograph anything on assignment there, much less a Hokkaido pre wedding photo session, with two of the kindest people I’ve ever traveled with, during a road trip adventure. To meet Amanda & Joel after two years of messages, in one of our favourite countries on this planet. Basking in stunning architecture by Tadao Ando at Moerenuma Park in Sapporo, scaling hills in Jigokudani (Hell Valley) outside the onsen town of Noboribetsu, and braving the rain in nothing but cotton yukatas as the rain came bearing down on us in Hakodate. The time I got to spend with these legends is something I’ll never forget. While it was good fun helping to plan their Hokkaido pre wedding road trip itinerary, I find it’s always the unplanned things about any journey and any occasion to travel that make it that much more memorable. These two Los Angeles based Singaporean creatives faced it all with an adventurous spirit and an incredible appetite for making the most of our time together in Japan. Here’s a wee peek at what we got up to.